While successful businesses vary wildly in how they operate, one aspect seems to be shared -- an established communication system, both internally and externally. Through this communication infrastructure, high-level leaders can stay connected with corporate leaders, managers, and lower-level employees, allowing for precise instructions, procedures, and overall progress, to be effectively communicated and comprehended by all parties involved. The problem most businesses encounter is maintaining that line of communication. This is especially true for larger companies with establishments in various locales. Most businesses, especially larger ones, often encounter some sort of flaw in their communication systems. Business leaders are often dealing with major, long-term operations, ultimately resulting in a lack of physical communication (verbal, face-to-face, etc.). For a business to function optimally, every leader and worker must know precisely what their responsibilities are. However, when physical communication is hindered, certain facial clues and bodily gestures -- both crucial for adequate comprehension -- are not seen. Over the years, the rise in technology (primarily smartphones) has led to a phenomenal increase in video conferencing technology, either through calls or instant messaging (IM) chats. While the percentage of individual use of video and phone conference services like Polycom is on the rise, businesses have also caught on, finding that the adoption of video conferencing can not only reduce costs, but improve the versatility of their communications infrastructure as well. Arguably one of the greatest benefits of video conferencing is the speed at which vital information can be communicated. Since most businesses have competitors, the simple aspect of being able to communicate important details (goals, sales quotas, deadlines, etc.) can be the stepping stone needed to get out ahead of the pack, so to speak. Another fantastic benefit is the ability to hold virtual meetings. What this means is that leaders, managers, associates, and employees can basically talk amongst one another from any location. For the most part, the bulk of communication within a business occurs through email because it is fast and convenient. However, emails can easily become misconstrued and interpreted wrong, likely resulting in a lack of communication. With video conferencing, however, because the communication is taking place face-to-face, business leaders can make sure their managers completely understand what is being asked of them. This in turn, can be translated effectively to employees. Not only that, but video conferencing also allows for any misunderstandings or questions to be adjusted immediately. Lately, the trend with most businesses is reducing their carbon footprint in order to alleviate some of the negative effects that might be afflicted on the surrounding environment. While it may not seem like it at first, video conferencing can actually help reduce this carbon footprint simply by reducing the amount of travel needed to facilitate business. Business executives are often on the move, traveling from place to place. This usually means taking a car or plane, which produce harmful emissions into the environment. However, the adoption of video conferencing can eliminate a significant amount of travel by allowing executives to communicate virtually. As you can see, besides reducing costs, establishing a video conferencing system within a business can result in a multitude of benefits. Ultimately, a business needs to be able to adapt and respond to various stimuli, both internally and externally. 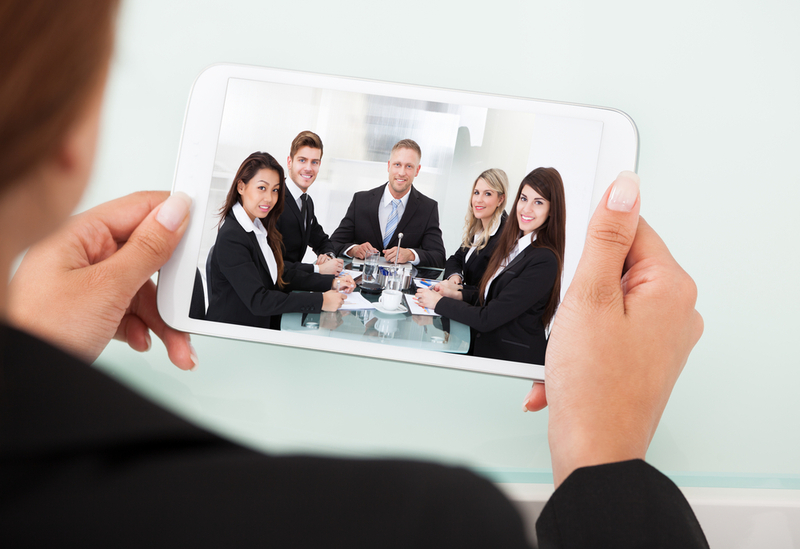 Video conferencing helps bridge the communication gap.